I took a look at the style for these types of paintings. Looks as if the black lines can easily be represented on the TI screen with a thickness of 4 pixels. Going for the multicolor mode (1979) is obvious and would fit perfect, I could even add some high resolution sprites for a bit of text. One could choose bitmap mode (1981) with no vertical color limit, but still only the maximum 2 colors per 8 pixels horizontally. I chose standard graphic mode (1979). With a base 4 by 4 pixel design and only 2 colors in every 8 by 8 pixel character, it still complies - no clashes. I'm sure it's not optimal, but I made a few routines bottom up. One for plotting a black "pixel" (4 by 4 pixels). The technique is like the one I used in this XB program. And then one for drawing lines and finally one for filling boxes. Edited by sometimes99er, Mon Jun 11, 2018 10:18 PM. Hi, how can I press Function-Quit (shown on the screen) on Classic99 ? I always thought things were easier back in the day. But I learned that a TI is not always just a TI. I once bought a german keyboard, but it was a bit difficult to use so I had to return it. A Mondrian keyboard should be perfect. Edited by sometimes99er, Thu Feb 9, 2017 3:44 AM. I like shapes too. Here's something to grasp. Apart from interpretation of Piet Mondrian's Tableau 1, we've also got his Composition 2. I thought you wrote an interpreter for the Piet programming language. And this is version 0.3. Some artist named Ziegler T took Composition 2, made a bit of graffiti and named it, My kid ruined my Mondrian. And this is what's been added to the demo. 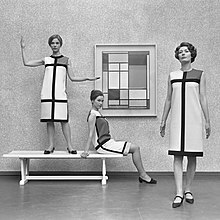 There were a bunch of other ideas, but I think the last part, of this demo, will be just randomly generated paintings in a style of Mondrian. Had to come back to this a few times, until I figured out ways to do this. Like creating a maze, which also can have several different solutions. Now I'm working with 256 bytes of CPU memory only, so I stayed clear of methods requiring or performing best with larger memory areas. Of course there's always the option of using the VDP RAM. I'm going for this one now. My canvas will be 64 by 44 "pixels" (larger than the 44 by 44 used previously). First layout is a random grid of black keypoints off the edges. I will go through each keypoint and draw lines from those. 2, 3 or 4 lines. Lines going all the way through the canvas should be possible then. 1 line only would have a line like sticking out into nowhere. Lines sticking out at the edges are okay though. Once all that is working and things have been adjusted, I'll choose some spots to fill in with color. Edited by sometimes99er, Mon Feb 13, 2017 5:40 AM. Got the random black lines going. Of course it looks incomplete without the colors. Adding colors will use flood fill. A fill can technically be more than half the screen, so, as with Minesweeper, I have to use VDP RAM for the stack of a recursive routine. I can go two ways: Use the 4 by 4 pixel plot system, or run through characters. I've started down the latter path.